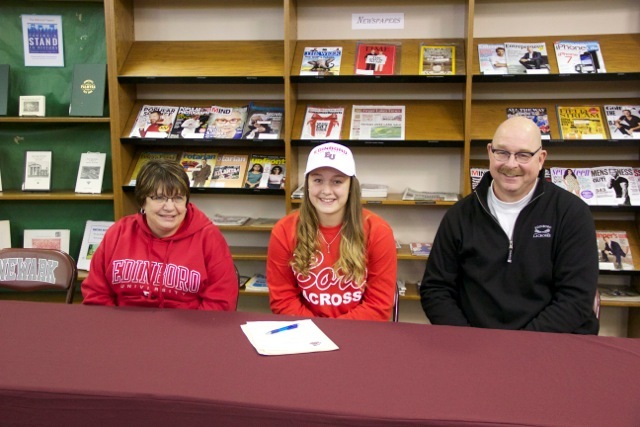 Katie Thoms, a Newark High School senior and Girls Varsity Lacrosse player, signed a National Letter of Intent November 14th to attend Edinboro University in the fall on a Division II scholarship. (L-R) Mary Thoms, Katie Thoms and Mark Thoms. Before the signing in the NHS library, Chris Corey, NCSD Director of Health, Physical Education and Athletics welcomed parents, coaches, teammates, teachers, administrators and lots of other well-wishers watching and congratulated Thoms. “It is with great pleasure that we can honor her accomplishments as a student-athlete here at Newark,” Corey said. “We are proud of her and her lacrosse accomplishments. As a center midfielder, she has been 2nd team All Finger Lakes for the past two seasons. Going into the upcoming season, Katie has scored 54 goals and 20 assists. We are excited to see what her senior year will look like as Katie has shown steady improvement throughout her high school career." Then Thoms, flanked by her parents, Mary, who teaches seventh grade English at Newark Middle School and Newark Police Department Sgt. Mark Thoms signed the National Letter of Intent. Thoms thanked everyone for coming to the event and for their support. “It really means a lot,’’ she said. Before, during and after the reception, others expressed how proud they are of Thoms’ accomplishments. “We are very excited for Katie to join our lacrosse family!” Caitlin Formato, Head Women’s Lacrosse Coach at Edinboro said later. “We are hoping that Katie can step in and contribute right away to our defensive end." “Katie is a passionate player that truly loves the game of lacrosse,’’ said NHS Health teacher Karen Cline, who is Thoms’ lacrosse coach. “Katie is not a selfish player and will feed the ball to any teammate looking to score. She doesn't know the word "quit", as she works hard throughout the entire game whether winning or losing." “Katie is hard-working and I am very excited for her,” Mary Thoms said. “I think Edinboro is a great fit for her academically and athletically. Words cannot express how proud I am–she has a bright future ahead of her." Katie Thoms said the coach and players at Edinboro made her feel “like it was home.” She hopes someday to be a college-level athletic director and will major either in health and physical education or sports administration. Like his wife, Mark Thoms said he couldn’t be more proud of his daughter. Thoms’ other coaches commended her on her accomplishments. “Katie as a three sport athlete was able to not only be a top player, but also a leader in the sports she is in,” said Newark Middle School math teacher Jason Dentel who is Head Girl’s Varsity Soccer coach at NHS. “As a captain of our soccer team, Katie demonstrated to our younger players what a well rounded student athlete is all about." Thoms, whose GPA at NHS is 91.61, takes Gemini courses through FLCC and AP courses. She is a member of Student Council, Youth 2 Youth, Varsity Club, Interact Club, Art Club, National Honor Society, Spanish Honor Society and Link Crew. AAU Basketball – She is a member of the Finger Lakes Fury and Finger Lakes Elite club teams. Club Lacrosse – Her mother noted her daughter was a member of the Relentless Hustle Lacrosse Club and previously played for CNYELC (Central NY Elite Lacrosse Club). Her high school training starts in March and ends in May. Club lacrosse starts in May and runs through the entire month of July. Fall lacrosse starts in September and runs through March. Thoms has one month off in August from lacrosse, but starts pre-season soccer in the middle of August. In lacrosse, Thoms, has been a varsity player for 4 years. She received All League Honorable Mention in grade 9; Second Team All-League in grade 10 and 11. Thoms was MVP in 2013 and 2015. She earned Best Offensive Player in 2014 and 2016 and won Scholar Athlete in 2014, 2105 and 2106. In soccer, Thoms, has been a varsity player for four years; Second Team All-League Soccer in grades 11 and 12; Coaches Award 2016; and Scholar Athlete 2014, 2015, 2016. In basketball, Thoms, has been a three-year varsity player who was Most Improved player in Grade 10 and Best Defensive JV player in Grade 9. Thoms, who has worked at Wegmans since she was 15, has volunteered for Coach Tim Tanea’s AECC summer soccer camp and Coach Fladd’s AECC summer basketball camp. She has been a volunteer referee for modified soccer; Cracker Box Palace, booster clubs, was a ball girl for soccer for many years prior to playing at the HS level, and Kitz soccer coach for one year. “Being a well-rounded person is one of the traits I admire most,” said Superintendent Matt Cook. “As a true three-sport athlete, Katie is not only well rounded athletically, she's a great student and a good person. Can't ask for more than that out of a Newark graduate!" 0 Comments to "Katie Thoms Signs National Letter Of Intent"